The Merge Layers dialog box lets you combine selected layers. Using the Merge Layers dialog box gives you more control when merging layers. You can name the new layer, specify whether it is a vector or bitmap layer, select source layers, and more. After you have merged a layer, it is still possible to edit it. However, any previously defined motion in the source layers will be lost. If you choose not to allow the layer to be edited, transform motion will be retained. For example, if you are using a .swf file and want to edit its layer, the layer you select will be retained. The rest of the layers will not be part of this layer. Makes the merged layer a vector layer. If there were bitmap layers in your selection, they will be converted to vector. 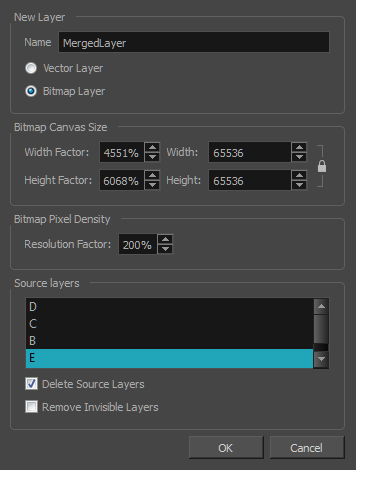 If your merged layer is bitmap, set the Bitmap Canvas Size parameters. Adjust the Width, Height, or Resolution Factor. These three parameters are linked; changing one, changes the others. Lets you set the resolution of bitmap layers.